Sunrise Yachts has laid the keel for a new Sunrise 45 metre yacht in build at its facility in Turkey. Sunrise reported three new superyacht orders at the Fort Lauderdale boat show this past November, one of which was for a new yacht in its 45 metre series. This news arrives, "following the success of Atomic and the many enquiries received since she was launched," Sunrise Yachts' Vice President of Sales & Marketing Jean-Claude Carme told Boat International. The keel is now being laid on this new Sunrise Yachts 45m, which will be hull No 3 and a sister ship to the new Sunrise yacht launch Atomic and to the first 45 metre Africa. Atomic stands out from her predecessor with a bold red racing stripe and details and a modern interior. 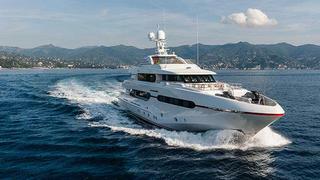 The yacht is intended for long-range travel, family use and adventure. Jean-Claud Carme tells Boat International that the deliver time for the new 45m project would be 24 months from now. The other two new orders include a 50 metre and a 60 metre superyacht, set to deliver in 2017 and 2018 respectively. Both of these are designed by Italy’s A Vallicelli & Co Yacht Design. Tony Castro recently unveiled a design for a 68 metre explorer yacht designed to suit a Sunrise Yachts' platform. The Sunrise Yachts 63 metre superyacht known as project 632 is due to launch this May.